Passanante’s Home Food Service is best known for our food delivery service and passion for hormone-free high quality meats and organic veggies, but you may not know that we’re equally as passionate about celebrating life’s moments with friends and family. We hope you will find an opportunity to enjoy this delicious cake in the company of all of your favorite people sooner rather than later. Add powdered sugar and vanilla; beat until light and fluffy. Combine all-purpose flour, sugar, baking soda, salt and ground cinnamon in a large mixing bowl. Add eggs and oil, stirring until dry ingredients are moistened. Do not beat. Stir in vanilla, pineapple, 1 cup pecans and bananas. Spoon batter into 3 greased and floured 9-inch round cake pans. Bake at 350 degrees for 25 to 30 minutes or until a wooden toothpick inserted in the center comes out clean. Sprinkle 1/2 cup chopped pecans on top. 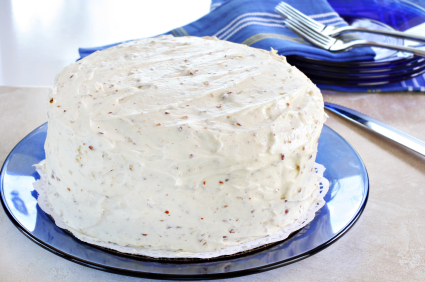 You can also combine the pecans in the actual frosting if you prefer. This entry was posted in Dessert, Recipes and tagged Dessert, Food Delivery Service, grocery delivery, Passanante's Home Food Service, Recipe by Passanante's Home Food Service. Bookmark the permalink.